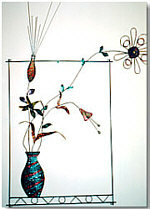 Metal wall hangings custom designed artwork. 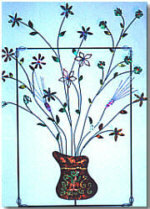 Unique landscape, floral, abstract, wildlife wallhangings can be made to match any contemporary, traditional or western decor. Metal artwork wall hangings are not new, but with our artistic abstract design we have given our pieces a feeling of motion and reality. 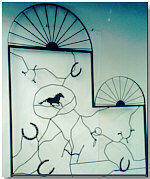 These custom designed metal creations can range from seascapes to landscapes to your own creative drawings and sketches. We can take your idea, add our creative twist and produce exciting, wall hangings to add a contemporary look to your home, office or retail store. There is no limit to what Woodman Metal Custom Designs can create. Add ceramic tiles, mirrors or scroll designs to give your metal wall hanging a unique look. Whether you are ordering single items for your home or office, or multiple pieces for your retail store, we can guarantee affordable pricing. 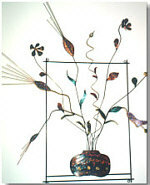 Let Woodman Metal Creative Designs create a one-of-a-wall hanging for you. If you are tired of the same pictures on your walls, let us create something unique for you. 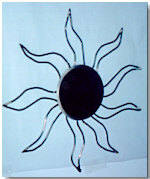 We have shown you only a few metal wall hangings we have created. The designs are limitless. 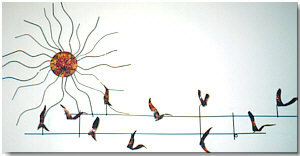 We will produce exciting, affordable custom metal wall hangings in any size, design or shape you'd like. Our custom designed wall hangings make perfect house warming gifts, wedding gifts or gifts for any occasion. If you are interested in any of our custom designed metal wall hangings, please email the measurements, shape, color, any additional features you'd like such as ceramic pieces, mirrors, grape motif, leaf designs, scenic or abstract designs. Since each piece is custom made to fit your decor it will be helpful to know the specifics so I can create a piece that will match perfectly. 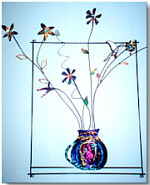 Floral metal wall hanging showing the different styles of flowers and vases available. We can custom design any floral arrangement with the colors and shapes you like. Create your own wall hanging from seascapes to landscapes using your own creative drawings and sketches.